On another slide, Gabrielli plots cumulative decline in existing fields against time. Consequently, the world needs one Saudi Arabia every two years just to keep production constant. Fortunately, new oil capacity from sanctioned projects can offset some of cumulative decline of 30 mbd in 2015. However, the chart above still shows a gap of over 5 mbd which needs to be filled by projects yet to be sanctioned or development of undiscovered oil. If this gap cannot be filled then demand cannot be met and prices will increase to reduce demand down to supply. Gabrielli’s concerns about peak oil capacity in 2010 and future declining world oil capacity should be taken seriously. 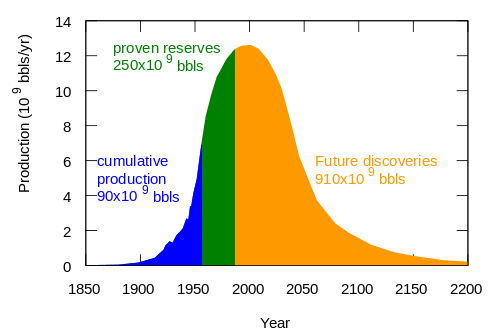 He shows that by 2012/13 the world oil capacity will only just meet world demand, based on Wood MacKenzie’s data, highlighting the risk of a potential oil supply crunch. If Wikipedia Oil Megaproject data are used then peak oil capacity is also indicated in 2010 as well as an an oil supply crunch in 2012/13. The IEA’s Fatih Birol has also stated that an oil supply crunch is likely to occur by 2014. In other words, the world does not have enough future Saudi Arabia equivalent capacity additions to stop world oil production from declining, causing an inevitable supply crunch within the next few years. The Obama administration is accelerating the deployment of new defenses against possible Iranian missile attacks in the Persian Gulf, placing special ships off the Iranian coast and antimissile systems in at least four Arab countries, according to administration and military officials. Military officials said that the countries that accepted the defense systems were Qatar, the United Arab Emirates, Bahrain and Kuwait. They said the Kuwaitis had agreed to take the defensive weapons to supplement older, less capable models it has had for years. Saudi Arabia and Israel have long had similar equipment of their own. He also described a first line of defense: He said the United States was now keeping Aegis cruisers on patrol in the Persian Gulf at all times. Those cruisers are equipped with advanced radar and antimissile systems designed to intercept medium-range missiles. Those systems would not be useful against Iran’s long-range missile, the Shahab 3, but intelligence agencies believe that it will be years before Iran can solve the problems of placing a nuclear warhead atop that missile. It’s important to remember that in the mouths of our “military planners”, words have a tendency to mean their opposite. Thus, “defensive” means “aggressive”; “defense systems” mean “offensive weapons platforms” and “deterrence” means “coercion”. With that in mind, the true designs of the United States become evident. Iran, you see, is not allowed to have nuclear weapons – or even peaceful nuclear power plants. Only the United States is mature enough to decide who can and cannot be “trusted” with nuclear weapons. Iran, naturally, doesn’t consider this legitimate or fair. So to “protect” themselves from the Iranian “threat”, the US sets up umpteen missile bases all along Iran’s border and arms its neighbors to the teeth. For “defense’, you see. It’s also worth mentioning that “missile defense” is error-prone, unreliable and impracticable. There is no technology capable of reliably shooting a missile out of the sky. None. The real point of setting up “missile defense” systems on Iran’s border is for offense – to have a quick button we can push if Iran further incurs our displeasure. We spend about $1 Billion per day on oil imports, and nearly all of it comes from highly unstable countries. The Center for American Progress report which features this map is called is called “Oil Dependence is a Dangerous Habit.” I highly recommend reading this. Continuing its wanton disregard for other nation’s sovereignty, and, indeed, the right of their citizens not to be bombed to oblivion, the United States unleashed a massive “drone” attack upon the Yemeni shores late last week. Of course, the standard excuse of “suspected terrorists” was deployed in defense of the strike, but curiously, no “terrorists” were confirmed to have been killed. The US did manage to murder more than 49 Yemeni civilians, including 23 children and 17 women, who, one assumes, feel quite dreadful about their “suspected terrorism”. Needless to say, this mini-atrocity saw almost no coverage in the US media, and the few papers who bothered to address the event did not see fit to mention the women and children deceased. Man, Obama is earning that Nobel Peace Prize! The Obama gave his much-anticipated military escalation speech yesterday, and while our mainstream pundits were busy falling over themselves to provide “strategic analysis” as to whom he pandered to when, they paid very little attention to what he actually said. We did not ask for this fight. On September 11, 2001, 19 men hijacked four airplanes and used them to murder nearly 3,000 people. They struck at our military and economic nerve centers. They took the lives of innocent men, women, and children without regard to their faith or race or station. As opposed to the way the US took the lives of innocent men, women and children with regard to their faith/race/station? Specifically, we “took the lives” of oh, 100,000 Iraqis and who knows how many Afghans, the majority of whom are poor and Muslim. So let it not be said that the US murders indiscriminately! We tend to prefer the poor, the Arab, and the Muslim. Under the banner of this domestic unity and international legitimacy — and only after the Taliban refused to turn over Osama bin Laden — we sent our troops into Afghanistan. Within a matter of months, al Qaeda was scattered and many of its operatives were killed. Taliban Ambassador Zaeef said, ‘We are not ready to hand over Osama bin Laden without evidence’. Not to mention, of course, that under NATO law the Afghan war is illegal, as Afghanistan didn’t attack anybody. Since then, we’ve made progress on some important objectives. High-ranking al Qaeda and Taliban leaders have been killed, and we’ve stepped up the pressure on al Qaeda worldwide. In Pakistan, that nation’s army has gone on its largest offensive in years. In Afghanistan, we and our allies prevented the Taliban from stopping a presidential election, and — although it was marred by fraud — that election produced a government that is consistent with Afghanistan’s laws and constitution. Wait… What? The election was “marred by fraud”, yet is still “consistent with Afghanistan’s laws and constitution”? Surely you jest, Mr. President! And the Afghan election deserves a stronger verb than “marred”, I think. Fully one-third of Karzai’s votes were fakes, according to the CS Monitor, and the United States blatantly pressured Karzai’s rival to drop out of the race, essentially making it a one-candidate ballot. Is that what Obama means by “consistent with Afghanistan’s laws and constitution”? So, no, I do not make this decision lightly. I make this decision because I am convinced that our security is at stake in Afghanistan and Pakistan. This is the epicenter of violent extremism practiced by al Qaeda. It is from here that we were attacked on 9/11, and it is from here that new attacks are being plotted as I speak. This is no idle danger; no hypothetical threat. Sure. Except that none of the 9/11 hijackers were from Afghanistan (15 of them were from Saudi Arabia – you know, our best friend in the Middle East – and two were from the United Arab Emirates, our other best friend). These facts compel us to act along with our friends and allies. Our overarching goal remains the same: to disrupt, dismantle, and defeat al Qaeda in Afghanistan and Pakistan, and to prevent its capacity to threaten America and our allies in the future. That’s a nice bit of alliteration: but what does it mean? “Disrupt, dismantle, and defeat” – is Al Qaeda some sort of nefarious robot or something? Actually, according to Marc Sageman (whose recent book, Leaderless Jihad, caused quite a stir last year), “Al Qaeda” and “The Taliban” don’t even exist, as such. Instead of cohesive, top-down organizations, these catch-all terms refer instead to what Sageman calls “bunches of guys”, decentralized pockets with no general leadership and wide, disparate goals. If Sageman is correct our entire “counter-terrorism” paradigm is wrong, and our efforts to “kill or capture Al-Qaeda leaders” have almost no effect on “their” ability to operate. And 35,000 soldiers can do nothing about that. And now, we must come together to end this war successfully. For what’s at stake is not simply a test of NATO’s credibility — what’s at stake is the security of our allies, and the common security of the world. With evidence that our actions in Iraq and Afghanistan have precipitated a seven-fold increase in worldwide terrorism, one wonders exactly what Obama is talking about. The days of providing a blank check are over. President Karzai’s inauguration speech sent the right message about moving in a new direction. His speech sent the right message? Well what kind of message did his massive electoral fraud send? Shouldn’t we listen to that one? *Sigh* Well, what more can one say?